We’ve all heard the phrase, “It’s a thankless job.” While many people are very conscious of the sacrificial efforts made by our military personnel, a lot of others never really think to show them their gratitude. How very different our lives would be without the brave men and women who serve and safeguard our freedom. 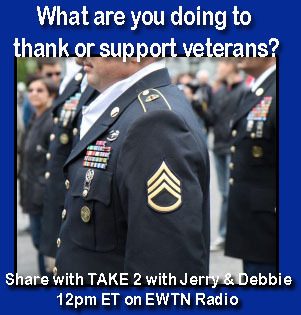 On Wednesday – Veteran’s Day – call with your takes about the individuals you know (or have known) who served in any branch of the military. We look forward to hearing from you at Noon ET (with a re-airing at Midnight ET)! Sad War stories; (From the ‘Soul Train’ files). In honor of Veterans day: I did my time…. Coming to Micronesia (as a Peace Corps/Missionary), after serving in the Military four years during the Viet Nam War, many young islanders ask me how it was. They ask because many of them are planning to join and have. I first tell them the ‘boot camp’ training is very difficult and they will be indescribably homesick. After that, though, they could be fortunate to get valuable training in medicine, computer or heavy equipment operators, flying, weather monitoring etc…and much more that they could come back and help their islands with and earn a nice living. Seriously, to my surprise, many prefer to just go in and join the infantry so they can get a gun and shoot the enemies. (like in the movies, of course). Then I go onto tell them some of the horrors of war that men returning from action rarely ever want to talk about, that continues to haunt them forever. I tell them that most wars are nothing like they see in the movies; rather troops worry mostly about the many unseen booby traps and snipers around them, with no chance to fight back, as the enemy remains mainly out of sight. In the Viet Nam War, much like in the current dessert wars, this is still the case. Most injuries and fatalities are the result of these two war tactics. So sad wars, where we learn there are no atheist in fox-holes…and no one really wins. May God forgive us and the leaders of governments we ourselves voted for. Today, my hats off, and prayers are on my lips for all my fellow veterans who marched with me, and for those who died in my/our place. Why military service in my family has been important to my life’s education and faith. When World War II broke out, my father was drafted in the U. S. Navy as a Tail-Gunner. His unit, which consisted of seventeen planes on board the USS Saratoga, was deployed to the South Pacific for combat. He shared with me that he, like most others, was very nervous about their upcoming engagement. Because of his religious convictions, he said he prayed daily that he would not have to actually kill someone, or be killed. On the night before their first run, while playing basketball on the carrier’s deck, as they did each evening, he received an eye injury. The ship’s corpsman patched the eye and grounded him. He remained on deck, only to remove the blocks from the tires of the planes as they took off for their missions. He never boarded a plane in all their time there, as his eye remained patched until they returned to U.S. waters. Eleven of his unit’s planes were shot down. He missed his fallen comrades dearly. Then, on returning to base, they learned the war had ended, and to add to the good news, he was told his eye had completely healed. He soon married, and I was born. Years later, on graduating high school, it was my turn to be drafted as the Viet Nam War started up. I had been planning to join ministry school, but I had no deferment possibilities, so I enlisted into the Navy at my dad’s suggestion. There he felt, at least, I would not be issued a gun as a ground soldier, for whom fire fights were common. And again he urged me too, to remember to pray daily that I would not be part of a situation where, “kill, or be killed,” would be the norm. The first answer to my prayer came, I felt, when I was told I would be a hospital corpsman. I was trained well and assigned to work at a busy Naval Hospital in California. I found new life, working in a field I had not considered; the healing ministry. I absorbed all the knowledge I could, and I found I had a given talent for this type of work and all it required. Two years later, I received orders to Viet Nam. First, I was sent to ‘Field Medical School’ at Marine Base, Camp Pendleton with twenty-two other corpsman. After over a month training and playing war there, we were taken to the airport with our sea bags for transport to ‘ Nam,’ as they referred to it. I had already returned to reciting the prayer my father recommended when placed under combat orders. To my surprise, I felt it was answered quickly right there. The pilot of our transport, stepped down from the plane, and informed us we had too much weight for his plane. Two of us would have to remain behind with our sea bags, and await further orders. Who would remain was then determined by placing all our names in a hat, and then drawing two out. My name was first to be drawn. We two remained working at the base hospital there for six months, before being transferred to 3rd Marine Division, Hawaii. There we worked at a base clinic with soldiers and their dependents. While there, our service time ended and we were honorably discharged; of the twenty corpsman that left for Viet Nam in our place, we learned six lost their lives. My prayers continue to this day for all their sacrifices. After my discharge I joined the Peace Corps in the U. S. Trust Territory of the Pacific/Micronesia, where I worked as a medic in island dispensaries. Later, I was able to use my G.I. Bill at a Community College there, and was the first American to do so. I went on to finish a degree in Physical Ed. at the nearby University of Guam. Then, I joined the Jesuit Missionaries in Micronesia as a brother, and have remained in this region of the world ever since. Today, when young islanders tell me they want to join the armed services, I tell them to strive to learn a good skill they can always use, and to remember daily, the power of prayer. (Some felt this was a sign of cowardice, but I tell them by all means not. We were all living under the same stress and in the line of fire at many times during or service years). Note: At 62 I left the Jesuits and went on to study theology in Fiji for the priesthood. I completed that and was ordained a Deacon, which I have retired as due to a medical issue and my Bishops decision. Currently I am a motivational speaker for the faith on Guam, enjoying talking with lots of youth groups and schools.